I’ve only written up product reviews of books for this site, since I figure people who follow an author’s website like books. I also read a good bit, so reviews are fairly easy content to create. Aside from devouring novels, I also play a lot of board games. Since I have small children—and good babysitters are hard to come by—I’ve never had the opportunity to do an escape room. So I was really glad when I learned that escape room board games are a thing. Solving the puzzles in these games involves cutting out, writing on, and destroying components, so these games can only be played once. In an attempt to find a puzzle-solving game that I could at least pass onto a friend after playing, I came across Sherlock Holmes Consulting Detective. It had great reviews overall, so I thought I’d give it a try. I’ve played both The Thames Murders & Other Cases and Jack the Ripper & West End Adventures, and this review is specifically for the second. In this game, your team plays as Wiggins and his crew of street urchins—consulting detectives who help Sherlock Holmes in a number of cases. For each case, you receive a case file and the day’s newspaper. With the aid of a directory and map of London, the players decide which locations they’ll visit in their investigation of the current case. For each address you stop by, there’s a corresponding entry in the case file which contains a short description of what happens when you visit each place. The challenge is to crack the case by going to as few locations as possible. All of the game components are high quality, so even though there isn’t any replayability after cracking each case, the game can still be passed onto someone else. Although I’ve read all the Sherlock Holmes novels and am intrigued by the Victorian Era, each place is described in excruciating detail. I’m not really a history buff, so I really don’t care what every single gas lamp looks like. The descriptions certainly add a lot of flavor, but it’s a ton of extraneous information when all I really want to do is solve the murder. Another thing that really bugged me about the writing was that tons of characters blatantly hit on Wiggins. He must be insanely attractive to have so many women—and men—fawning over him. At times, my husband and I were able to make leaps of logic that even Sherlock missed. Like immediately recognizing that there was something on the other side of that newspaper clipping. However, for the most part, Sherlock made tenuous connections that were near impossible to find. Oh, didn’t you see that random newspaper article from four cases ago about a suicide? Clearly, that random man was a member of high society and killed himself after being spurned by a former lover, a woman involved in the current case! Well, at least the article says he killed himself, but to deduce the rest, you’ll have to look up his name in the directory and talk to his son. In the end, Sherlock would solve the case in only a few moves, while we would visit location after location, having more and more people tell us information we had already learned. Even after visiting all the places he’d gone to, we still wouldn’t come up with the same conclusions as Holmes. And we’re not dense—we’re puzzle people. We both enjoy word puzzles, number puzzles, riddles, strategy games, etc. Only after reading reviews did I realize that other people would visit thirty (that’s a lot!) locations and spend four hours on a case. I usually give up after 90 minutes, since I have small children and don’t have the luxury of being able to carve out an entire day to play a board game. I’m not trying to say that this is a bad game, just that it was not a good fit for me. Obviously, the ratings show that plenty of people loved it. 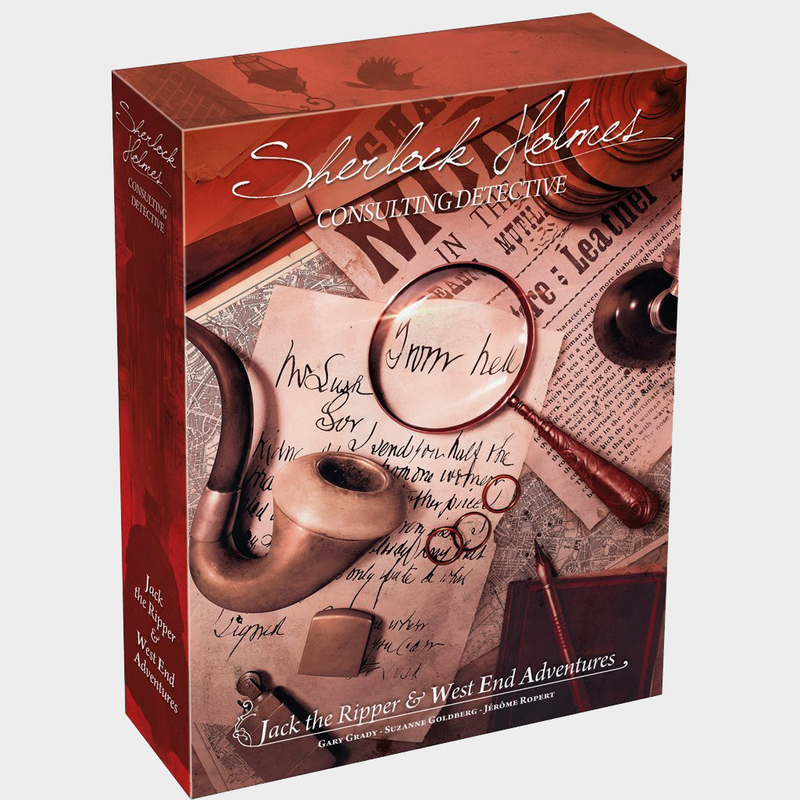 If you enjoy submerging yourself in Victorian London and slowly unraveling a murder mystery without actually being able to solve anything, then you’ll love Sherlock Holmes Consulting Detective.